Emerging Food Brands looking to grow have limited options financially. Many we talk to are self-funded through sales. This can be hard when they need to come up with the capital to buy raw materials, packaging, or labels to convert into final product when they need to fill orders. The more the sales, the better the opportunity is to have the cash for the next order, with a little left over for profit. This got me thinking. I’m a small business owner, and I tend to operate with a “buy-it-only-if-you-can-afford-it” mentality. But I also have a line of credit and a good relationship with my bank in case I need to invest in new equipment, staffing, or training to service new business. But what happens if I am growing faster than my traditional financing relationships can help? This series explores the finance options Emerging Food Brand have if they want to grow. Questions about financing? 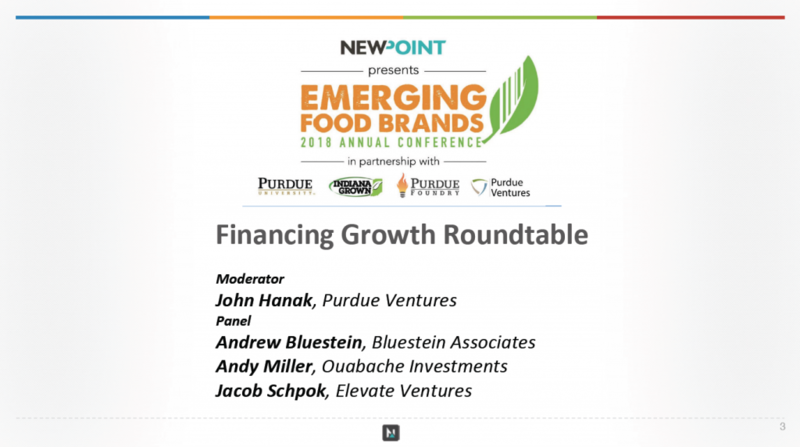 The content of this Financing for Growth Panel portion (and all program content at our conference) was submitted as questions during registration by the 64 food company/brand attendees. Our expert presenters then addressed the questions—and more—in their programs. In the coming weeks, we’ll be posting each presentation to the “Intel” section of our website. So check back often! Let’s start by introducing the experts. John Hanak (Moderator): Managing Director of Purdue Ventures. John is the Managing Director of Purdue Ventures and also an Entrepreneur in Residence at the Purdue Foundry. Formerly, he served as the Statewide Director of the Purdue Technology Centers. He has held officer-level positions at a Fortune 500 metals manufacturer, a middle-market machine-building company, and a technology product development firm. Additionally, he co-founded a technology commercialization and consulting firm and a small investment partnership. Andrew Bluestein: Co-Founder & Managing Partner, Bluestein & Associates. Andrew is the co-founder and Managing Partner of B&A, which includes developing the firm’s investment strategy, leading the investment committee, and advising portfolio companies. He sits on three boards and is an observer on another three, including Factor 75, Bizzy Coffee, and Rethink Water. In addition to his work at B&A, Andrew has served on the steering committee of the Good Food Business Accelerator and as a mentor at 1871. Andrew brings to B&A a deep and diverse background working with emerging leaders to grow their businesses. Andrew spent over seven years as a strategy consultant at Monitor Deloitte, working on/in corporate, competitive, marketing, and organizational strategy across a diverse set of retail, CPG, hospitality, and business service clients. Andrew has an MBA with distinction from the Kellogg School of Management and a B.S. in Industrial and Labor Relations with Honors from Cornell University. Andy Miller: Managing Director, Ouabache Investments. Andy leads the Ouabache team bringing prior experience as Corporate Development Leader at Weaver Popcorn where he focused on sourcing and evaluating larger bolt-on opportunities. Andy began his career in brand management with companies such as P&G, Nabisco, ConAgra, and Weaver Popcorn. Andy also served in three cabinet-level positions in the administration of Indiana Governor Mitch Daniels. Jacob Schpok: Entrepreneur-in-Residence (EIR), Elevate Ventures. Elevate EIRs provide first-time entrepreneurs with business advisory services to help them navigate the uncharted waters of starting a business, from launch to exit and every decision in between. Schpok will be primarily focused on the Elevate-Purdue Foundry initiative with Purdue University as well as help with our efforts in and around Lafayette, West Lafayette, Zionsville, and surrounding areas. 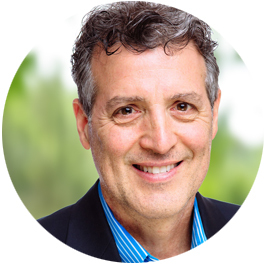 Schpok was co-founder and CEO of Child Life Products, has served in various capacities with the ISBDC including as the Executive Director and more recently as VP of Operations at Sharpen Technologies. John Hanak, moderator: I think you’ll find this session today to be something that’s going to be very helpful relative to raising capital for a company. What I can tell you is it looked to me, based on the questions, that a lot of you are approaching your company in the traditional financing sense. 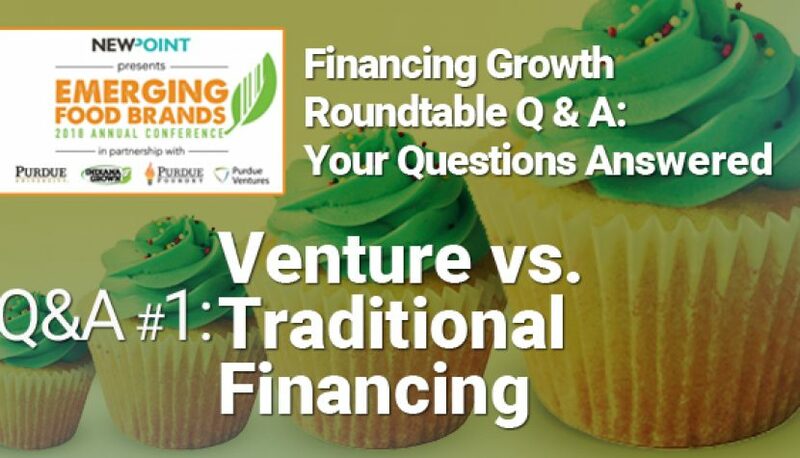 What we’re going to focus on today is a little bit of that, but mostly it’s going to be talking about the distinction between venture vs. traditional financing. We’re going to take a little bit more of a start-up approach to this, but, I think with this panel, and the experience they have covering all aspects of financing, you’ll still get a lot out of it. So what I’d like to do is start with introductions. Andy, I want to start with you. If you can introduce yourself, talk about your firm, talk about the verticals that you typically invest in, and also the profile of the companies looks for. Andy Miller: Sure. I’m Andy Miller and with the Weaver Family Office. It’s the Weaver Popcorn family; I’m sure some of you have heard of Weaver Popcorn. The family started Family Office about 12 years ago, and then last year we created what’s called Ouabache Investments, of which I’m the Managing Director. Our sole goal is to use the Family Office funds to put into companies that are just shortly after new, so one to two years old. They have a lot of upside potential. From our standpoint, we focus exclusively in the food and agriculture space, and that’s just because we like to help bring value to the companies that we invest in. Being a packaged food company, we feel we can bring a lot of value to that. Very interested in meeting some of you today. Hopefully, there might be a good fit. As I’ve told John and others, we are very excited about Indiana companies, being an Indiana company, and hoping to have some of our investments be right here in the state. John Hanak, moderator: Thanks, Andy. Next, I’d like to introduce Andrew Bluestein, from Bluestein and Associates. Andrew Bluestein: Hi everyone. I’m Andrew Bluestein. Bluestein and Associates, we are similarly a family office that my family and I started about four and a half years ago. Our family – my dad and I – come from the consulting space. My mom ran a company called Ingredion, which was formerly known as Corn Products, a Fortune 500 food ingredient company. About four and a half years ago, we started our family office. We decided to focus on doing early stage investing. My dad and I both like helping companies think about growth — both the opportunities and challenges of it. We felt the innovation ecosystem that was developing at the time within Chicago (we’re based out of Chicago and the Midwest) was taking off. We felt food was a pretty exciting space because of all the changes in what people were consuming and how they were consuming it. Andrew Bluestein: Our focus is similarly early-stage, you’ll maybe hear us today talking about financing rounds. We think about ourselves in the seed in the series “A” financing rounds. We model ourselves like a venture capital firm even though it is family capital. We’re looking for companies that can get big returns. We cover the food and retail industry as a whole. We do both consumer and B-to-B (business to business). On the consumer side, we’ve done consumer products, we’ve done e-commerce, we’ve done a little bit of retail. On the B-to-B side, we focus on a lot of technologies for the industries. We’ve done logistic technology, restaurant technology, marketing technology. We kind of take an expansive look at the industry and pinpoint where we think are the most interesting areas of innovation. John Hanak, moderator: Thanks Andrew, and finally Jacob Schpok from Elevate Ventures. Jacob Schpok: Good morning. I’m Jacob Schpok. Elevate Ventures. We operate very much like a traditional, institutional investment firm. We’re rather industry agnostic though. We’ll invest in anything from medical devices to new agriculture products, so long as they’re innovative in nature, have the potential to scale, and have a market cap of a billion dollars, since ultimately, we want to see a 10x return on the investments that we’re making. We’re quite active. PitchBook, who rates investment funds, rated us as the most active investment fund in the Great Lakes region, and we’re top 10 globally. All of our money is directed exclusively in Indiana businesses. What makes us unique is that we’re a nonprofit organization, and our largest limited partner, for a firm, is the state of Indiana. We’re deploying resources from the state, and investing in businesses in the state, to help cultivate the economy. I serve as one of the entrepreneurs and residents. There are seven of us across the state, and it’s our job to work with entrepreneurs pre- and post-investment. They come in, either to Elevate or to other investors, put their best foot forward, and in post-investment, we help them navigate the process of actually deploying those resources and setting themselves up for the next round. Our investments range anywhere from 20K investments that we’ll do in partnership with Purdue, up to two million in a round, with four million for the life of the business. John Hanak, moderator: Thank you, Jacob. As you heard, we do a lot of work with Elevate at Purdue Ventures. Just a word about Purdue Ventures, it’s part of the Purdue Foundry. If you’re interested in learning more about the Foundry, go to PurdueFoundry.com. We are the startup up here at the University. We currently work with about 200 or so client companies, a little more than half of which are commercializing Purdue intellectual property, but our doors are open to everybody, and I hope you can take us up on that offer. Purdue Ventures is a portion of the Foundry that manages access to talent and capital. We run three small seed funds — one of which we run jointly with Elevate Ventures. We have about 35 million dollars under active management, which is small by any VC standards but makes us the sixth or seventh largest venture in the state. So, that’s Purdue Ventures. John Hanak, moderator: I do want to get back to some discussions here, but first a question for you. How many of you, of those who are running companies, have financed your company traditionally, through a bank loan? (several hands raise). And how many of you have financed your company with friends and family money–which would be your own money as well? (several more hands raise). Okay, far more of that. That’s good to know. One of the things I want to have the panelists explore is their perspective on venture vs. traditional financing and what they look for; because, typically, venture to invest has everything to do with finding the exit–because they’re looking for that return on capital as opposed to a return on a loan. They’re looking for bigger multiples when they exit. I think, Jacob, starting with you, if you can talk about it, you have a unique background relative to what you did at the SBDC, and you’re fully aware of the traditional financing approach, but now you find yourself in a venture. You can share your perspective on that. Jacob Schpok: Absolutely. As John mentioned, in a previous role, I was working closely with entrepreneurs that were raising more traditional capital sources, like a bank loan. For those of you who aren’t familiar with getting a bank loan for a business, the process includes developing a full-fledged business plan, including financial projections, bringing it to a banker. Then, the banker looks at it for 10 minutes and then digs in deep on what collateral you have, so if something goes belly up, they can get all their money back from whatever money you have in your home or any other liquid assets that you can put on the line. It’s very traditional. I mentioned homes; it’s very similar to the way you’d look at a mortgage. For an institutional investor, or for raising based on giving up equity in your business, and taking the approach of bringing on investors, it’s quite a bit different. Many of you have probably heard that investors, a general trend is, will make ten investments, nine of them will fail, one of them will break even, and the last one will make more money than what they put in for the other nine. What that means, is that tenth business has to at least make a 10x return to break even on all the investments that are made. With that being said, an investor, if they’re doing a good job, needs to look for at least the 10x return on every single investment they’re making, and still try to make a smart decision. I know environmental factors and other outside circumstances are ultimately going to be calculated in whether or not their risk-reward leans in their favor. For us, Elevate Ventures and many other investors, to have confidence around that 10x return, the largest components are tied towards the management teams being able to execute on a business model that can easily scale. Can you take what you’re currently doing today and continue to grow it exponentially without there having to be a number of cogs in the machine that could be disruptive to the whole business model being successful? Layer on top of that, for a lot of businesses, they don’t necessarily have intellectual property, like patents for example, that protect their position in the marketplace. A larger business, or a better-capitalized startup, could come in and start competing directly with that business. That brings in the second question: How quickly can this business scale and take over either in the national or global market before competitors come in? And if they do come in, will we be far enough along where there’s a potential acquisition? A lot of startups end up not having an IPO or going public, and it truly is a lot of acquisitions that end up allowing investors to achieve their returns, as well as entrepreneurs and founders to achieve their returns. John Hanak, moderator: Great, thanks, Jacob. Before we turn to Andrew for his perspective on that, how many of you have a written exit strategy? Okay, that’s kind of what I would have expected. One or two. How many of you have plans to grow your company and sustain it for the long term? Okay, good thanks. It helps give us a perspective. Andrew, you can give your perspective on traditional vs. venture financing and the whole exit concept. There are different capital providers out there that may be helping you reach your goal. If your goal is to have a nice small, lifestyle-like business that you grow gradually over time, that’s where getting something like bank financing is potentially more of a fit. They’re going to give you a loan that’s going to be financed or have some collateral that you’re going to have to guarantee, but you’re not going to give up any of your equity. You’re not going to give up any of your control, and you can run the company how you want it. If it becomes a million dollar a year company or two million dollars a year company, eventually you pay down that bank loan, and hopefully, then you can take the proceeds from that business and start generating a return. Now when you start saying, “I want to grow a 50-million-dollar company or a hundred-million-dollar revenue company.” The next question you ask is, “How do I go about doing that?” That’s when you start going the route of finding equity investors; because, frankly, the bank–when they give you a loan–they’re not planning for you to become a huge company. They don’t structure the loans so that they make a ton of money off of you. They want to give a lot of loans and make a little bit out of everybody. As it relates to us, we think fairly similarly to Jacob, in the sense that we’re looking for home runs. When we analyze businesses, we try to say, “Can we get a five times return? Can we get a ten times return? Is there an opportunity for an even larger return?” That’s really where we want to spend our time and capital because we’ve been learning ourselves around how to do venture, and found over time, that it’s only a couple of companies that do generate our returns. With every investment, every dollar we spend, we’re trying to find those. Saying that, when we make investments, we try not to be irrational with how we manage those businesses. Over time, not every business may have that potential, and certainly, you want to make sure that you generate a good outcome for the entrepreneurs as well as the investors. It’s not always every company is a zero or a 10, but for us, when we’re thinking about businesses, we want to think that’s the potential we’re shooting for. John Hanak, moderator: Great, thanks, Andrew. Andy, will you give us your perspective? Andy Miller: Sure, John. To reiterate, I think it’s essential that you start out knowing where you want to go. We’ve looked into a lot of businesses that have the potential to be bigger, but the owner doesn’t necessarily want to be bigger. They like the concept of the lifestyle business. We always hope to look at companies that demonstrate some in-market potential, and I believe if you can get to that point without going for equity, if you can use that financing family and friends, that’s going to have a tremendous impact on your valuation. When you go to equity investment, one of the things you’re going to negotiate is, “What is the value of my company?” That will be a direct link to how much of the ownership the equity investor is going to put in. To the extent that you can demonstrate that you have in-market potential, your ability to have a higher valuation is going to be greater. That’s not to say in your very early stage company, pre-revenue, you can’t get equity investors, but your ability to negotiate value is going to be somewhat of a challenge, just because you haven’t demonstrated that in-market. If you can get to the point where you’ve shown some in-market potential, before going and asking for equity investment, your chances of giving up less of your company are much higher. From our standpoint, the other thing we like, also, is we want to be active investors. There are passive investors; there are active investors. A passive investor’s probably going to be someone who is less likely to show up on your doorstep every day, asking how your business is going. They’re going to want to know how things are going, but they’re probably not going to be out there being active. We want to be active, and that’s why when we look at a company, we ask ourselves, “Can we bring some value to that management team? To that company?” Whether it’s in helping to manufacture, whether it’s in helping in developing better marketing and sales plans, we want to come alongside them and be an active participant. Back to the very beginning, you’ve got to ask yourself, “How much help do I want?” And also, “Where do I want that help to come in?” Those are some questions to ask, as you look at an investor, to make sure you are on the same page as it relates to them. Want to learn more about investing, finance or maybe walk through something in this post? I’d love to hear from you. Contact me at patrick@newpointmarketing.com.